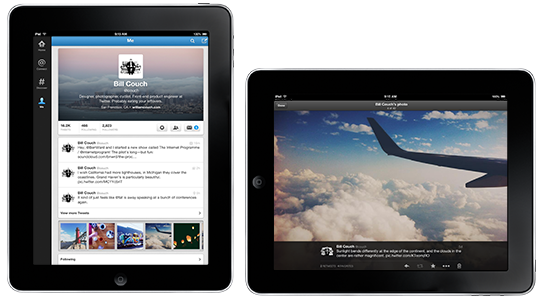 In a move that's certainly a nod to the image-heavy nature of today's mobile web, Twitter announced their redesigned app for iPad. While their value proposition of "connect and discover" are largely unchanged by this, it certainly is a snappier product. In our opinion, the new app is not quick as tight as an experience as some other 3rd-party Twitter clients, but close. We're also guessing some iOS 6 support is on-hand for this update. And following the lead of other social networks like Path and Facebook, Twitter has also introduce the new "Header" photo feature, viewable on user's profile pages. This largely useless addition merely means more "self-expression" for individuals and "enhanced messaging opportunity" for brands. Brands and agencies can now add this image type to the growing list of media required to support social channels. This is very cool! I really need this information because I am researching on social media platform updates, This article will really helped me. Thank you for this. In the other hand, I wanted to share to you my blog best horror games. Hope you visit.